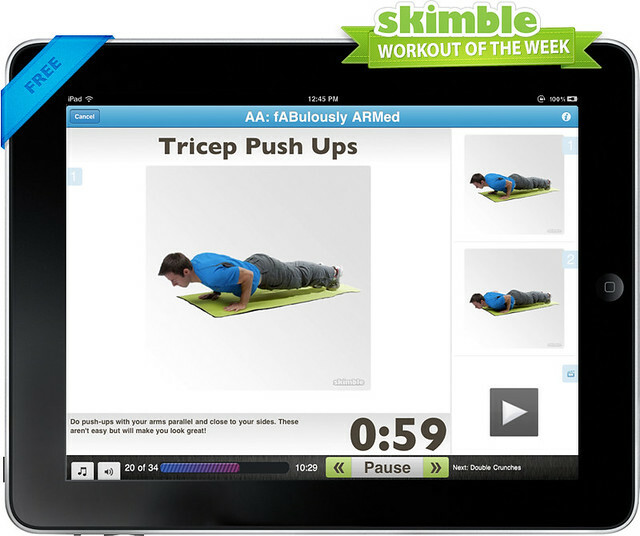 Do AA: fABulously ARMed, the intense Workout of the Week! Now that we have your attention: this week’s ‘double A’ workout is designed to get your ABS and ARMS looking fabulous. Do this workout every week to get that beach-body everyone just wants to drink up. Our trainer clocked over 150 calories burned completing this 25min workout. Beware, fABulously ARMed is intense…and if you do manage to do max reps, you’ll have certainly earned your post-workout drink for the day! This entry was tagged abs, arms, challenges, exercise, skimble, workout, workoutoftheweek, workouttrainer, wow. Bookmark the permalink. One Pitch at a Time: The Nose in a Day (NIAD), an El Cap Yosemite journey. Photo & Video Recap of Skimble’s Happy Hour at Rock Health + EatLifeWhole & Lombardi Sports treats!